Every four years, when the World Cup comes around, the same old build up occurs. Television programmes start showing countdowns of the World Cup’s greatest moments, the movie ‘Mike Bassett: England Manager’ is aired more times in a week than over the last four years and your dad and grandad tells you about how they don’t make teams like Brazil 1970 anymore. While World Cup countdowns and Mike Bassett have pretty much run their course, nobody will ever get bored of watching football’s greatest ever team, Brazil 1970. When people think about football in modern times, it’s mostly about the Champions League. It is true that it has taken over international football in terms of popularity and commercialisation, mainly because it is so accessible. Previous generations were not as fortunate and before the Premier League boom arrived in 1992, televised football was nowhere near as common as it is now. During the 1970’s the only live football on television was the FA Cup final and the World Cup. So, when Brazil were winning the World Cup in 1970, everyone with an interest in football was watching, mesmerised by the skill and technique of the South Americans. Over decades, that memory has stayed with many of those young football fans who have now passed it onto their children and grandchildren. Bright yellow tops, blue shorts, white socks and the football, the beautiful football. Football is a simple game and nobody made it look more simple than the Brazilian team in 1970. They played the game in a unique way but it was exactly the way the game should be played. They had the skill, they had the full range of passing, they moved the ball around and just when the opposition were least expecting it, the tempo would be raised and Brazilian team would score. Coming into the 1970 tournament, Brazil were in a bit of disarray. João Saldanha, who had been a controversial character was removed from his position as manager in the months leading up to the competition and was replaced by 1958 and 1962 World Cup winner, Mário Zagallo. When appointed as manager, Zagallo was 38 years old and on taking the job, his brief was to find a way to fit all of Brazil’s stars into the one team. The biggest issue was Brazil’s star players were five number 10 style players so it was easier said than done for Zagallo to find a way to include all of them in the starting 11. In the end, Zagallo decided that the basic formation would be 4-2-4 with the front four all being number 10 style players while Gérson would join Clodoaldo in midfield. Another interesting initiative was that he decided to play Cruzeiro’s, Piazza, who was normally a midfielder at centre half so he could start off attacks from the back due to him having a better range of passing than most defenders. As Brazil left to participate in the World Cup in Mexico, hopes weren’t particularly high back home and many fans even hoped the Seleção would crash and burn as they believed an unsuccessful tournament would put pressure on those that were in charge at the time. It was felt that there was too much of a political influence on the team and large swathes of the population were against it. Outside Brazil, the team would have been regarded as a contender. They had won the 1958 and 1962 World Cups and although they were disappointing in 1966, they had Pelé who was considered to be the best player in the world and that meant they always had a chance. For Brazil to progress, they would have to do things the hard way as they were placed in a difficult group. Czechoslovakia were the team they had beat when winning the 1962 final and England were the defending champions having won the trophy on home soil in 1966. Romania were the outsiders of the four but they had beat Eusébio’s Portugal to qualify which meant they had to be treated with respect. Group 3 games were all scheduled to take place in the Estadio Jalisco in Guadalajara and Brazil began their campaign on 3rd June 1970 against Czechoslovakia, a day after a Geoff Hurst goal saw England beat Romania 1-0 in the opening game of the group. Brazil’s campaign got off to a terrible start when Ladislav Petráš opened the scoring for Czechoslovakia after 11 minutes but it didn’t last long as Rivellino powered home a left footed free kick 13 minutes later after a foul on Pelé. The teams remained level going into the second half but Brazil took control as the game wore on and Pelé got behind enemy lines before chesting down and hammering home on 59 minutes. Two minutes later, Brazil scored a third when Jairzinho beat Ivo Viktor to the ball before lobbing the goalkeeper and blasting home from close range. With seven minutes remaining, Jairzinho was able to net again, this time after a mazy run before beating the goalkeeper with a low shot. Three days later, the Czechs were beaten again, this time by Romania which made Brazil and England’s clash on 7th June 1970 take the look of a group decider. Between them Brazil and England had won the last three World Cups, so it was very early on in the tournament for the two heavyweights to clash. Sometimes when games like these come so early in the tournament they turn into a tense yet tepid affairs but this was exactly the opposite. England went for the jugular from the beginning and seemed to believe that Brazilian goalkeeper, Felix was the weak link. Sir Alf Ramsey’s side peppered his goalmouth with crosses and shots from distance but he stood firm and had a good game despite a few tense moments. One of football’s most famous moments came in the first half of the game when Jairzinho got to the byline and crossed for Pelé who rose above the England defence and headed down low into the corner but his effort was kept out of goal by Gordon Banks who made what many consider to be the best save of all time. England had a great chance themselves in the first half when Francis Lee got on the end of a cross with a diving header but Felix made an excellent stop before being knocked out when Lee kicked him in the head when going for the rebound. The breakthrough finally came on 59 minutes when Tostão found Pelé after some good work down the left wing and Pelé laid the ball into the path of Jairzinho whose powerful shot finally beat the seemingly invincible Banks in the England goal. England pushed hard for the equaliser and had two golden chances. The first, and the one that really should have been scored, fell to Jeff Astle. Astle pounced on a loose ball in the box and with the goal at his mercy he managed to blast it wide of the goal. Shortly after, Alan Ball hit the bar with a shot that Felix got fingertips to and the man who many still consider to be the weak link of this famous Brazilian side had saved the day for his country in what would be arguably the toughest test they would face on their way to glory. In Brazil’s final group game they were scheduled to play against Romania, knowing that a draw would be enough to secure their place as group winners. Zagallo was confident they would do just that and took the opportunity to rest Gérson and Rivellino from the Gala 11. Brazil made a good start and took a 2-0 lead thanks to two goals in two minutes. Pelé powered home a free kick on 19 minutes before Jairzinho tapped in after good work from Paulo Cézar on the left wing but Romania weren’t going to go away easily and they reduced the arrears on 34 minutes when Florea Dumitrache latched onto a long pass before turning his marker and poking into the net. With three quarters of the game gone Pelé restored Brazil’s two goal advantage when he managed to slide home after a beautiful Tostão flick at the near post. Again, Romania weren’t ready to accept defeat and got it back to 3-2 thanks to a headed goal from Emerich Dembrovschi but Brazil held on to win 3-2 to maintain their perfect record throughout the group stage. England secured a place in the quarter-finals alongside Brazil after winning their last game against Czechoslovakia which kept alive the possibility that Brazil and England could end up squaring off again later in the tournament but as it happened England were eliminated by West Germany in the quarter-finals. Brazil’s reward for topping Group 3 was a meeting with their South American rivals, Peru, again in Guadalajara. Peru had finished second in their group behind West Germany but ahead of Bulgaria and Morocco. At the time, Peru’s star player was Teófilo Cubillas and he was enjoying a good tournament with four goals in the group stage. The game got off to a near perfect start for Brazil when they scored twice inside the opening fifteen minutes. Rivellino opened the scoring after 11 minutes when he drilled a lay off from Tostão past Luis Rubiños in the Peru goal. Four minutes later, the same combination linked up again when Rivellino found Tostão and he blasted past Rubiños from a narrow angle but in truth the goalkeeper should have done better. On 28 minutes, it was Felix in the Brazil goal that would be at fault for a goal when Alberto Gallardo got to the byline and hit a powerful shot with the angle favouring the goalkeeper but he somehow let it past him. Early in the second half Brazil managed to score a third. Pelé done well to get behind the Peru defence and his cross took a deflection which beat the goalkeeper and allowed Tostão to blast home from close range. With Brazil seemingly cruising towards a place in the semi-final, Peru made things interesting when they got the score back to 3-2 with 20 minutes remaining. After what looked like a game of pinball in the Brazil box, the ball fell to the great Cubillas and he scored his fifth goal of the tournament with a blasted effort from the edge of the box. However, there would be no great comeback and Jairzinho put the game to bed five minutes later when he rounded the goalkeeper before slotting into the net to complete the 4-2 scoreline and send the Seleção into the last four. Once again, Brazil would be in Guadalajara for their semi-final and once again it would be a South American opposition with Uruguay their opponents. Despite Brazil going on to have a lot more World Cup success than Uruguay, many in Brazil are still scarred by losing to La Celeste in the Maracana when Brazil hosted the World Cup in 1950. That result meant Uruguay won the trophy and Brazil would have to wait another eight years before finally lifting the famous Jules Rimet Trophy when they won the 1958 tournament. It looked as though Brazil might end up being struck by the Uruguayan curse again when Luis Cubillo got behind the Brazilian backline on 19 minutes and gave his team the lead with a shot across goal into the far corner. Uruguay almost held onto their lead until half time but they conceded just before half time. Clodoaldo picked the ball up in midfield and played a pass out to the left wing and then continued his run into the box. The pass, when it came, was perfectly weighted and Clodoaldo ran onto it and drilled home the equaliser. Just after half time, another of football’s memorable moments occurred. Pelé ran onto a through ball and it looked like a 50-50 between him and Ladislao Mazurkiewicz but Pelé dummied it which made Mazurkiewicz miss the ball and Pelé ran around the other side but he hooked his shot too much and it went right across the goal and wide. While that opportunity was wasted, it wasn’t long before Brazil did take the lead and it was Pelé who started off the move. He played the ball to Tostão who released Jairzinho down the right and he managed to outpace the defender before slotting past the goalkeeper. The game remained in the balance until the very end when Brazil got the goal that secured victory. Again Pelé was in the middle of it when he collected the ball on the left before laying it into the path of Rivellino who powered his shot into the goal from the edge of the penalty area to send Brazil to their third World Cup final in four tournaments. In the final, Brazil would play Italy who had come through an extra time thriller against West Germany which they ended up winning 4-3. Prior to that they knocked out hosts Mexico in the quarter final and topped a group that included Uruguay, Sweden and Israel. At the time of the 1970 World Cup, Italian football was at an extremely high level, especially in terms of defending, thanks to the famous Catenaccio system but Brazil made short work of them in the final in front of a crowd of over 107,000 in the famous Azteca Stadium, Mexico City. Brazil got off to a good start in the final when Pelé opened the scoring on 18 minutes. A Brazil thrown in was taken and then crossed into the box and Pelé rose high at the back post to head beyond Enrico Albertosi in the Italian goal. Italy managed to get back into the game on 37 minutes when Roberto Boninsegna got in on goal and he was able to slot it into the empty net when the chasing defenders slide tackle took it past Felix who had come rushing off his line. The scores remained level until 66 minutes when Brazil finally took the lead again. This time it was Gérson who picked the ball up outside the box before switching it onto his left foot and firing a powerful shot into the goal from distance. Five minutes later, Brazil took another huge stride towards lifting the trophy when they scored the third goal. This time it was Jairzinho who scored when Pelé headed into his path and he mis-hit the shot although it still found its way into the goal which meant Jairzinho had completed the tournament with a goal in every single match. As Brazil cruised to victory there was still time to put the icing on the cake and it was another of those moments that almost 50 years later we are still watching in awe. Most of the Brazil team were involved in the move as it eventually landed with Jairzinho on the left wing, who found Pelé in the middle and his perfectly weighted pass was met on the run by captain Carlos Alberto who blasted past the goalkeeper to clinch a 4-1 win. Brazil won the 1970 World Cup in style. In total, Brazil used 16 players on their way to victory although it is clear that Zagallo had a preferred eleven. Of the six players in the squad never got any game time during the 1970 World Cup, two of them went on to have reasonable international careers with Zé Maria appearing in the 1974 World Cup while Leão played in both the 1974 and 1978 competitions. For the remainder of the squad, they never really did much for the national team that although Dario did win a handful of caps but Ado, Baldocchi and Joel never really made the breakthrough. Of the five players who played in 1970 but weren’t part of the first choice 11, only Roberto and Fontana didn’t stay in the Seleção after the tournament as they both fell out of favour and sadly, Fontana died in 1980 at the age of just 39 years old. Edu who played just 16 minutes in 1970, had been an unused squad member in 1966 at the age of 16 and also participated in the 1974 Finals, won 32 caps in his career while Marco Antonio and Paulo Cézar both played in the 1974 World Cups and won over 50 caps each for the Seleção. As good as some of those players were and some of them were very good, they were never up to the standard of the Gala 11. Zagallo’s first picks all knew their place in the team despite the manager coming in quite late and while he did rotate a bit, the team for the first game, the semi-final and the final was exactly the same and there’s no doubt that Zagallo had complete faith in that eleven and they more than repaid him with their performances during the tournament. In goal, Felix was always regarded as the weak link of the team and while he did have a few shady moments he had his fair share of excellent moments too, most notably against England. The back four are rarely talked about with the exception of the skipper, Carlos Alberto. While everyone knows the right back, people are less familiar with Piazza, Brito and Everaldo which is unfortunate as while the attacking players were making headlines they were doing their job at the other end with minimal fuss and with the focus so much on the attack, they often had little protection. The protection that they did have, came in the shape of the 20 year old midfielder, Clodoaldo. Clodoaldo is another who doesn’t always get the praise he deserves but if one watches the famous Carlos Alberto goal, the man who ghosts past the Italian midfield with a series of step overs is none other than the young midfielder. The men who did get all the praise and attention, and to be fair they were well worth it, were the front five. All five of them played in at least two World Cups with Gérson and Tostão also in the 1966 squad while Jairzinho also played in 1966 and 1974. Rivellino participated in the 1974 and 1978 tournaments. Remarkably, despite being regarded as the greatest football team of all time, Pelé was the only player who won more World Cups in the entire squad. He won the tournament three times, in 1958, 1962 and 1970. His manager, Mário Zagallo was in the 1958 and 1962 teams but when you consider how highly regarded Brazil were and the success they had at the time, it is somewhat surprising that nobody else won more than one World Cup. Over the years the World Cup has seen some great sides. There are fond memories of the Dutch sides that failed to win in 1974 and 1978 World Cups, Brazil 1982 are another great side that didn’t win it, others love the Italian teams that won back to back titles in the 1930’s or Argentina’s team that were inspired by Diego Maradona to win the 1986 tournament or Spain’s famous 2010 side that won the World Cup. 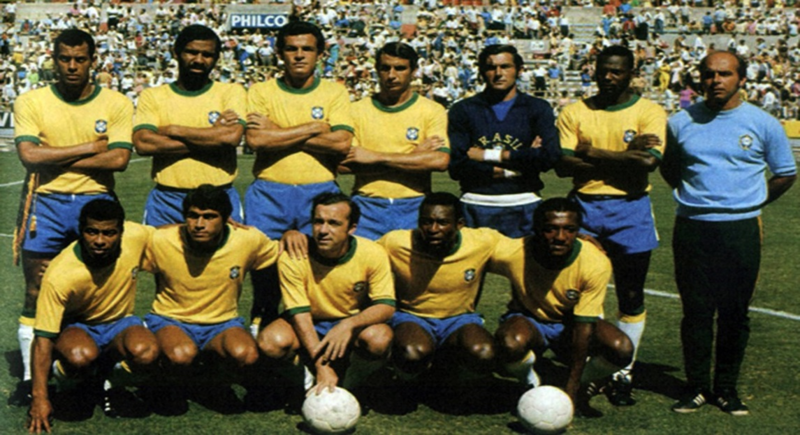 However, throughout history the one that outranks them all is the sublime Brazilian side from 1970 that brought flair and style to the competition which led a football obsessed nation to their third World Cup in 12 years.